Back in the day, plastic surgery is done in secretly. But nowadays, its increasing popularity resulted into a widespread acceptance of the procedure. Many local celebrities can be seen looking as if they are not aging. However, not everyone can afford plastic surgery, nor is everyone willing to go through it, a natural and an affordable solution? ATC Grape Seed Oil, a supplement that works from the inside out, packed with ingredients that keep the skin radiant and fresh. All-natural extract containing “Oligomeric Procyanidin”, an antioxidant 50 times more potent than Vitamin E, and 20 times stronger than Vitamin C. This antioxidant is said to have the ability to protect our bodies against free radicals which damage cells, allowing us to have healthier and more radiant skin. ATC Grape Seed Oil also helps in providing relief against pain and swelling cause by conditions like rheumatoid arthritis because of its anti-inflammatory products and contains proanthocyanidins, which are very potent antioxidants that help in diminishing the sun's damaging effects and lessen free radical damage. 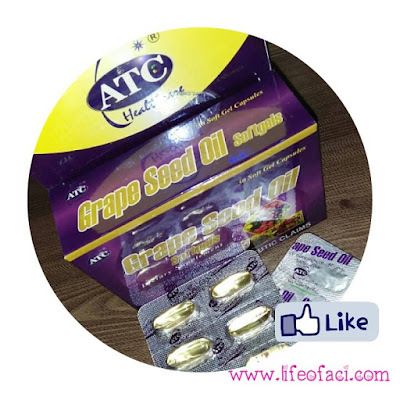 However, ATC Grape Seed Oil is not a medicinal drug and should not be used to treat the symptoms of any disease.